I’ve been crossing my fingers for the past couple of weeks, hoping, that we weren’t going to get this awful stomach flue that is going around. This last week has been a nonstop battle against it. Hand sanitizer. Antibacterial soap. Vitamins. You name it. But the last 5 days I’m afraid that we’re most likely coming down with it. We’re all grumpy and tired, and hungry in the way that nothing sounds good, and even if we do eat, nothing settles right. Maybe, knock on wood, this will be the worst of it. And if there are a few grammar errors, please forgive me. I feel like I’m writing through a fog. And then, since I’m venting anyways I might as well add that, I have my husband that’s deciding that he’s gonna do a juice diet. So even though he’s not sick, and never does get the bugs that pass around within our household, he’s not going to be eating either. Which frustrates me cause he’s like my all time favorite person to feed. In my grumpy, not feeling good, nothing sounds good, my stomach hurts but I don’t want to eat, mood, I decided to throw this together. I’ve been having this problem where I think, “Oh this would be such a cool new recipe to create”. Then I make it and photograph it, and get on Pinterest just to find out someone else has just created and posted the same exact idea. It’s maddening. How my mind is working in sink with so many other people is beyond me. I’m trying to decide now whether just to embrace it and post the recipe anyways, or scrap it. This at first was one of those recipes. 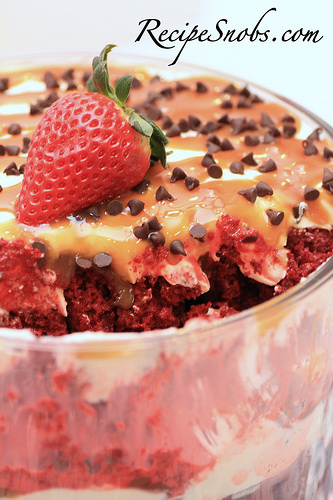 I was originally going to just make Red Velvet Tres Leche, but then was on Pinterest and someone else has just done it. 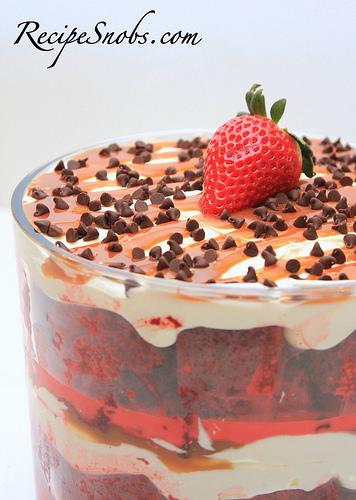 I figured I’d take it a step further so it would still be original and turn it into a trifle. On the upside, even though I’m being a total “Oscar the Grouch” right now, I’m super excited with how this turned out. Who was the genius that decided to take that glass of milk they were drinking and pour it over the cake? Ingenious! 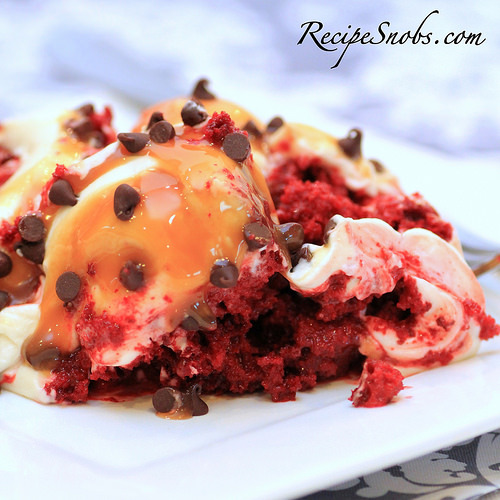 One of my favorite ways to eat Red Velvet!! Or cake for that matter 😉 Enjoy!! Prepare cake mix as directed. 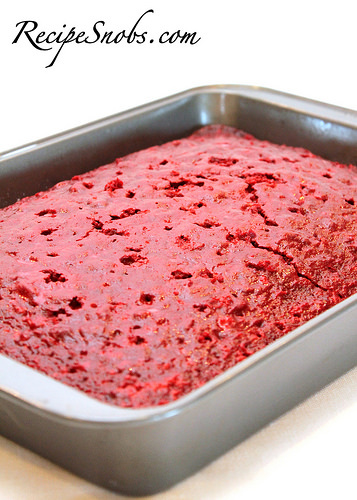 Place cake batter in a 9×13 inch pan and bake according to directions. Let cool completely. In a medium bowl whisk together evaporated milk, condensed milk, and whole milk. Set aside. Using a kebab skewer to poke multiple holes into the top of cake. Poor milk mixture over top of cake and let sit until cake has completely absorbed. 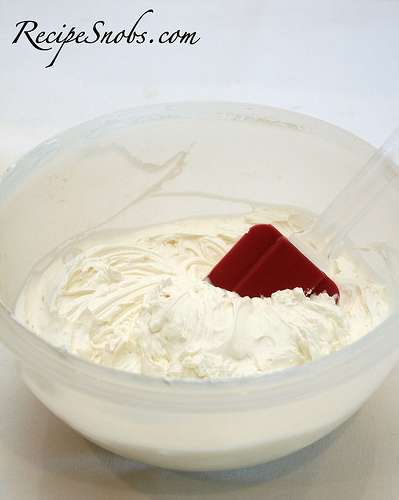 In a separate bowl combine cream cheese and mix on medium speed until smooth. Add cool whip and powdered sugar and mix well. Set aside. 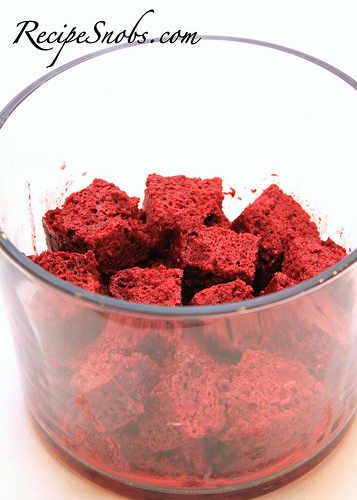 Cut sheet cake into cubes, and using a spatula, scoop cake cubes out of pan and place into the bottom of trifle dish. Cake will be very moist and will fall apart easily, so handle with care. 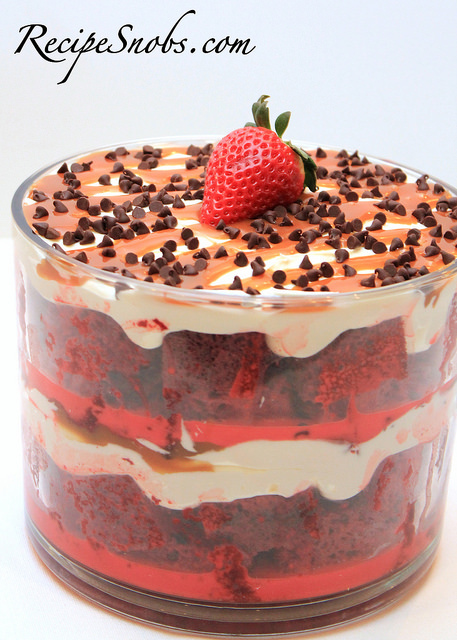 Make 2 layers of cake cubes, and then spread half cool whip mixture over cake cubes. 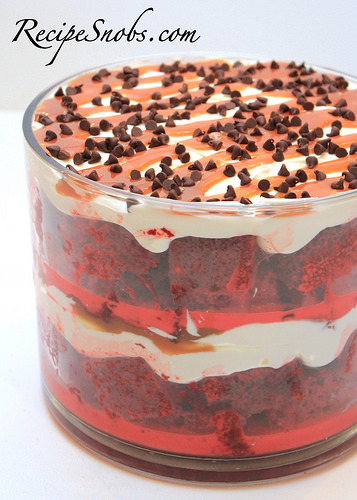 Top with half caramel and mini chocolate chips.